Love the floors - What brand / material / finish? Hi linbporter - thanks for your question! This is actually a quartzite stone counter. Good luck with all of your projects! I like the floor color. Lighting source - I'd love to know where the cool lights over the island can be found. Thanks! Hi lesliebarr - aren't they fun?! These are actually a great find from CB2 called the Loft pendant! Good luck with all of your projects and be sure to let us know if you have any more questions! Stools - Beautiful work. Where are the stools from? Can you tell me where you got the bar stools. Exactly what I'm looking for. thanks! Stain on ship lap wall - What stain is on the rustic oak? Hi Caitlin Mcgraw - thanks for reaching out! This is a custom stain from our vendor on Nantucket. Good luck with all of your projects and be sure to let us know if you have any other questions! Beautiful! Size of the island - Would you be able to share the size of the island please? Hi mcmeunier - isn't this island awesome! It is 11' x 4' so plenty of room for prepping and entertaining! Good luck with all of your projects and be sure to let us know if you have any other questions! Ship lap wall - What type of wood ? Hi mathamann - we love this waterfall wood wall feature! Its made from reclaimed rustic white oak boards. Good luck with your projects and be sure to let us know if you have anymore questions! Wow- beautiful - Your work is stunning!! Would you be willing to share the source for the Barstools please? Hi kushigrl - thank you so much for the kind words! These are the Paludis stools from Alias and were purchased through Montage in Boston, MA. Hope that helps and be sure to let us know if you have any other questions! Behind oven? - Another gorgeous house! LOVE your work! What room(s) are to the left of the stove and passed the sink? What is through the doorways to the right of the stove off of the entryway? Where Can I find those stools? - Where Can I find those stools? I LOVE your style! 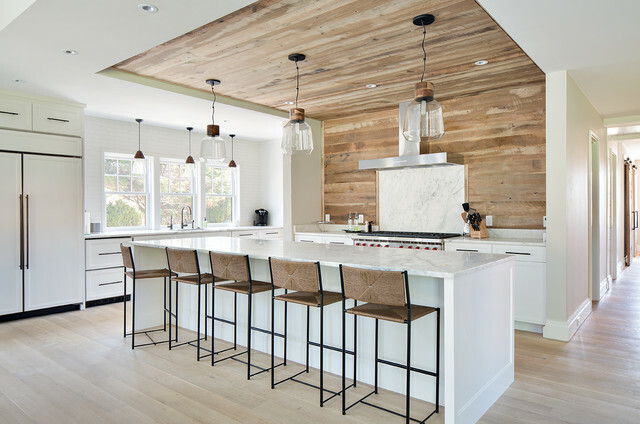 - Your beach style homes on Houzz are my absolute favorite! Please share with me where you purchased the stools. Also, are the cabinets painted wood or laminate? If painted wood, what colors, and what color are the walls? Thanks you sooooooo much!!!!! Stools - Love the stools can you tell us where you found these? Great rustic and modern balance.